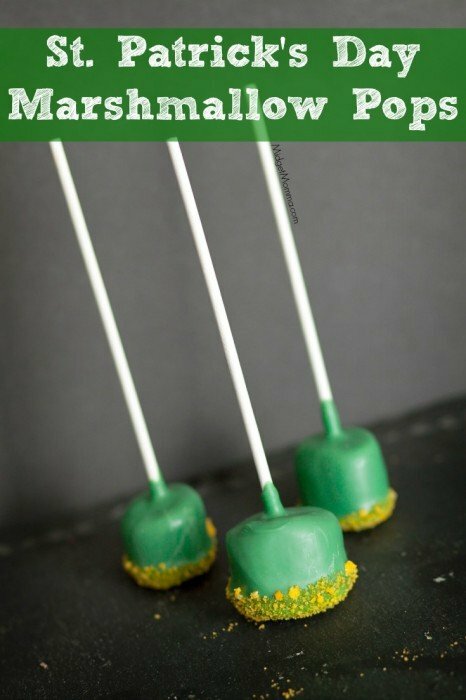 You will not need the luck of the Irish to be able to make these yummy St. Patrick’s Day Marshmallow Pops. They are very simple to make my three year old even took a crack at making some all by herself….. they might not have been as cute but they tasted great! Check out here to learn how to properly melt your dipping chocolate. Check out How to make colored sugar. 1 Bag Marshmallows – you want the 10 ounce bag of regular jet-puffed marshmallows. Pour your yellow sanding sugar into a bowl. Melt your chocolate and the first shortening in your double boiler. Pour your chocolate into a tall glass. Dip the end of your marshmallow stick into the chocolate then stick it into the marshmallow. Repeat with all the marshmallows. Dip the marshmallow into the chocolate then dip the end into the sugar. Place the marshmallow onto a sheet pan and repeat with the rest of marshmallows. Let the chocolate set for 20 minutes. Kiss me I’m Irish cupcakes …. Made with Bailey’s Irish Cream Frosting!